I’ve been busy these past few weeks — creating prints of my work and working on commissions, most of them gifts for the holiday season. 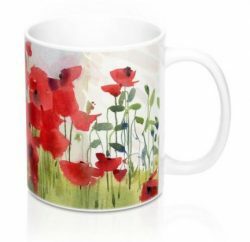 What could be nicer than a gift of art, whether it be print or original? The series below are sketches I created for friends who wanted to give each of their three grown kids a sketch of Montreal. They asked me for this last April, but of course I put the project off until now since winter is my favourite painting season (and because I’m a procrastinator). My intention when I finally got around to starting the project was to find some sort of theme to tie the sketches together, and after spending a morning taking some reference photos, the images I liked the best were the ones with lots of signage in them. For windows begin with an overall wash of the lightest colour, preferably warm. In St. Viateur Bagel Factory (above) I used yellow and burnt sienna to create a warm glow, especially since the lettering on the window is yellow. Then I painted around the letters (negative painting) with darker tones, leaving the lettering as the lightest element in that area. 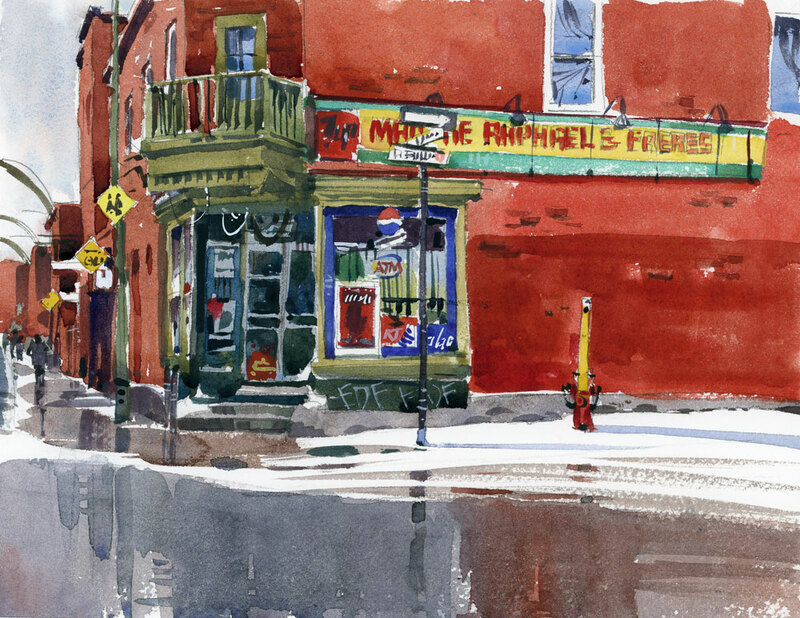 Work towards the darkest tones, like in the dépanneur scene below. For these windows, my starter wash was yellow, green and red. I also left a few white highlights for interior lights. If you have a sign with a darker background and light lettering, like the red Coca Cola signs, use some Titanium White watercolour to do the letters. I dip a small brush directly into the tube of paint and use it full strength with almost no water. All the lettering doesn’t have to be legible. Suggest some of it, like I did on the street signs. And don’t paint it all at full strength. Paint parts of the letters. The eye will fill in the rest. I use a small flat brush for this. Use a bigger brush than you think you need for this, since you don’t want to get caught up in too many details. Again, be suggestive with shapes and colour. And at the very end, go in with a fine rigger brush to add the final details with the darkest paint you have. I think I see material for another book! Great tips. What great ideas for gifts! I currently paint some winter’s “thing”for each of my brothers for a Christmas card. I’ve done different things but this year it’s a mug of hot chocolate with a candy cane sticking out of it. I have 4 to do each year and I thoroughly enjoy the project! Sounds like you are busy too. I bet they love receiving these cards! Thank you for the great tips on painting. I will try that. Glad it was helpful Georgia! Wonderful painting and great tips! Thanks! Thanks so much for this mini tutorial. Your teaching skills are shining! I love them all. The color, sign work, compositions, reflections. It’s all magic, as usual. Great to hear Jeff. I had so much fun with these. So much life and personality in your paintings. I’m in awe once again. Love these paintings! So clever when my brain can’t see it as paint, it’s real wet roads, brilliant! This is just what I needed to learn to redo some of my paintings of local buildings. I have been fighting with two views where the corner store is the center of attention. I appreciate your tips on the windows and the lettering. In the 3 you show here, I love the wet streets.They add as much interest as the stores. There is one street corner here where the main corner store is a tattoo parlor and has black windows with skulls. Any suggestions on this type of window ? Perhaps I should try greys and not get too dark. It is actually an ugly building. Thanks. I’m glad this was helpful Judy. As for your tattoo parlour, I would say that you should have fun with it. Instead of trying to hide what it looks like, I would exaggerate the ugly bits. Make the skulls really prominent! Will give it a try. Drove by it yesterday. Still ugly. Then why draw it at all?? Good question. Why keep after something that isn’t fun to paint either. Once again, you’ve helped me. You’re right. Why should I keep after this one? I so look forward to all your posts– you are an amazing artists! Thanks so much Lisa. See you soon! These are absolutely wonderful! I believe it is the combo of art and explanation, teachings along with art that puts you over the top in expertise. Yes, great inspiration for a next book! Thank you for helping us “see” more clearly. So nice of you to write this Bernadette. I don’t always have the time to make my posts educational but I try to do it when I have time. Super! So much life and character. Very informative! You perform magic with your brushes!! Thanks for all the tips, Shari! Thanks Linda. I’m glad they’re useful. As always, a big thanks Monique! Great tips. 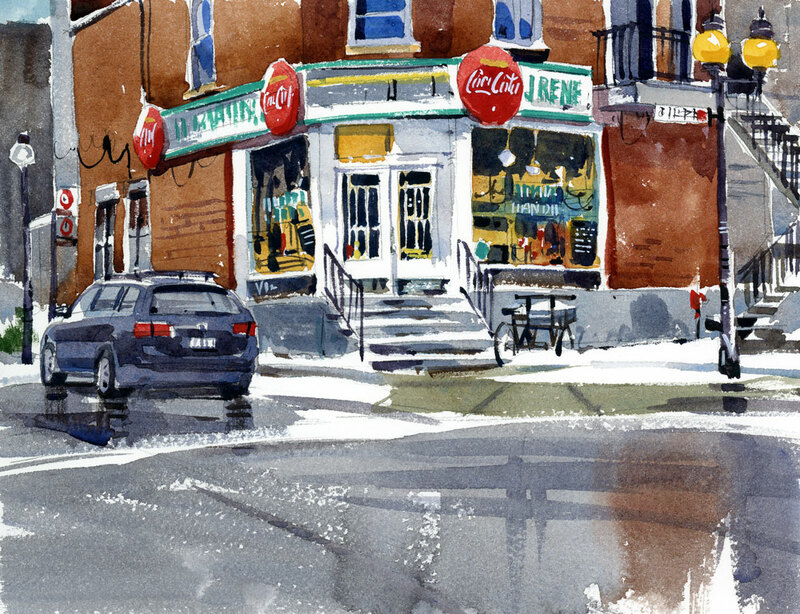 Wonderful paintings that truly capture the spirit of these very typical Montreal scenes. Marvellous work Shari! Thanks Alison. I hope Nikki and Steve like them too. And I love your sign paintings! Your sketches just get better and better. Shows what consistency can do. Wish I had that trait. Thanks so much Susan. I appreciate that very much. Such good memories, lived in this areawhen first immigrated. Got married in thembig church on St Viateur. Thanks. 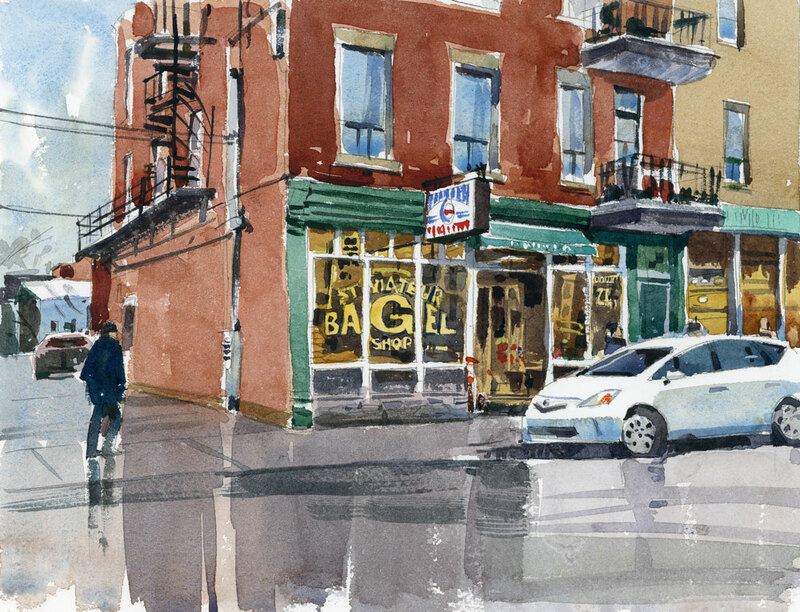 My dad grew up on St. Viateur, right across from the bagel factory. I love the neighbourhood! Of course I know the church and I’ve sketched it too. Thanks for writing Suzi! Great advice about the signs and the windows especially! While I am not an artist, your colorful prints are something to see, so much detail. As a writer, I try to find special details to include. Thanks for sharing! Good job on those paintings!! Love, love your work . . . and as someone above said, yes! . . so love the wet streets! Somehow, corner entrances into old shops, banks, businesses in (usually) small towns of a previous century always intrigue me. I’ve been to places like these. Often the old wood flooring is intact and carefully maintained. I love the sound of my feet walking on these floors. So your paintings bring back some fond memories for me. Thank you! Exactly. All the things you describe are exactly what I love about these old places. And I always wonder how long they will be around. Wow, you’re amazing in what you do! This is beautiful. If you do it as a book , please do let me know. I sure will publicize it! Fantastic paintings! I must share your site with my Mom, who is a painter too! Share away! Hope she enjoys the paintings! I love the art! It looks beautiful! like your painting and presentation . Beautiful detailed pieces. All the best. There is some great precision in it! I am a cityscape fanatic and impresses me. I am a photographer, and hope to connect with you! Thanks so much. I had a great time painting these and hope to do more soon. Your tips are spot-on and so helpful. I’m working my way through “Sketching the City…” on Craftsy and learning a lot. Regarding a recent sketch I did of an interesting Greek Coptic Orthodox Church in our area, someone gave very positive feedback on how I handled the windows to which I responded “I owe it all to Shari Blaukopf!” Thanks for all you share. Hi. Thanks so much for writing, and of course for taking the Craftsy class. Glad you like it! It a pleasure to share my sketches, but especially nice when I hear from people who take the classes! All three are fantastic! Boy your car in the first is spot on! Everything is! Hey! I loved all your paintings. They are amazing! Actually, I have been trying to make cityscape for a long time but there is always something missing in my paintings and the things in paintings somehow don’t coordinate with each other. I had a problem in making windows. I would definitely try out the tricks that you have shared. Thanks for sharing the tricks and tips! Thanks so much for writing. I’m really happy to hear that this was useful!! I’m here courtesy of Jean MacKay, and just wanted to say thank you for posting this. The sketches actually remind me of New York City back in the 60’s and 70’s, when I first lived there. They’re wonderful. Thanks for having a look. Jean’s post was a great introduction to some beautiful blogs, including yours.